In these days of increasing energy costs it is important to do as much as possible to reduce any waste. 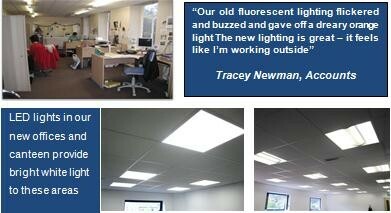 We have been fortunate to be able to turn to experts in the field of new lighting technology and have installed LED and INDUCTION lighting into our new factory. Light –emitting diodes (LEDs) are solid state semiconductors that convert electrical energy directly into light in a process called electroluminescence- a process that requires much less energy than traditional light sources. 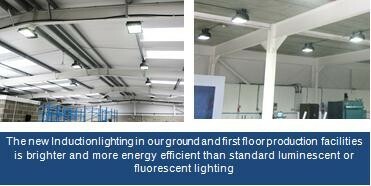 In our production areas we have fitted Induction Lamps. These are very similar to conventional fluorescent lamps but have fully sealed fluoescent lamps with electromagnets wrapped around part of the tube. These lamps are far more effiecent and as no electricity passes through the tube they last considerably longer. We calculate that with all the lights on, including the emergency lights, total consumption is 9.9kwh, compared to 29.9kwh had we installed conventional lighting. The installation of low energy lighting to our new premises further demonstrates our commitment to protecting the environment by significantly reducing our carbon footprint. We continue to thank all those clients who have returned to us and to those who are providing us with fresh opportunities to be their preferred spring and wire form supplier. We are delighted with our new premises and plan to hold a series of open days over the coming months to which you will be formally invited, however we continue to offer an open invitation for you to visit us at any time.